We as the redeemed must look unto Jesus keeping our hearts and minds stayed on Him. We must all be aware of the holy life that He lived. We are to always keep in remembrance how He persevered in His trials and what He endured all the way to the cross that we might inherit the holy covenant paid for with His blood. Jesus is “the author and finisher of faith”. He is the cause of our faith. In our carnal nature we are void of faith; we do not possess the power within ourselves to have faith without him. His grace empowers faith within us by His power and omnipotence. Our faith is in Him, through Him and by His spirit alive in us. Christ our Lord is our blessing of grace, empowering faith within us to believe upon Him, that we might obtain salvation and inherit eternal life. His faith working in us will maintain and strengthen us that we finish the race and obtain Glory. When we are facing hardship and trails and grow weary, we must remember what Jesus suffered and endured for us to obtain mercy. As we face hard times, we must steadfastly look to Jesus, keeping our thoughts on holy affections, in all things considering Him. What are our little problems and trials compared to His agonies? What are our trials compared to eternity with Him? What are our trials compared to the hardships of many others? Many times weighed down by our struggles, we tend to grow tired and weary, and we began to doubt and grow faint under the affliction we endure. Doubt makes us grow tired, but faith makes us grow tall. We must not faint under trails, but believe and stand tall knowing that we are under the care of a wise and gracious Father, and that all things work for our spiritual good. 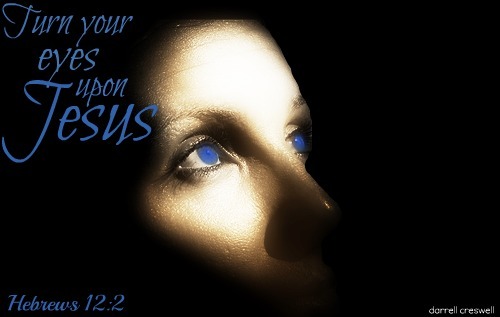 We must fix our eyes on Jesus- Fix our eyes on the love of God. We must be rooted and grounded in Him; be firmly persuaded of Him, knowing that nothing can separate us from Him. Nothing can separate us from the covenant and promises of God. The covenant of God performed in Christ Jesus and the promises delivered by His blood are powerful, firm and sure. We can depend on the faithfulness of God to make them good and to perform them in our lives. We can depend upon Him as our Savior laying all our problems and stress upon His redemptive grace, relying on His righteousness for our justification and atonement. He will supply all our needs, bear all our sorrows, and comfort all our burdens. He is our preservation and we must depend upon Jesus, and trust in Him for protection and defense. Focus on Jesus – Jesus said, “If you have seen me, you have seen the Father.” He came to save a lost and dying world entrapped and enslaved by the curse of sin. He spoke of the good news and preached that the kingdom of God was at hand. His message was to show God’s grace and compassion to a lost world. His miracles were to show the love of God to those in need. His focus was to bring salvation to the lost. Jesus was bringing focus to a God who sent His son to die and pay the penalty for our sins that we might be redeemed. Focusing all eyes onto a loving God was the only means to salvage a lost and dying world. That was the message then, and that is the message now. His message continues to be relevant in the 21st century. Real men throughout thousands of years wrote what we know as the Bible, as God was revealed in their lives as they sought Him and focused their lives on Him. Jesus wants to reveal himself to you, where you are in your own personal world; live in you and through you, as you focus your eyes and life upon Him. It is absolutely essential that as believers we set aside all that would distract our heart and eyes, and focus on God. This requires personal, spiritual focus – it is something for which each of us must strive. It is only in Christ that we are able to have a clear picture of God. It is in only in Christ that we are able to see God and know Him for who He is. Only lives that are focused on Christ that can know God. Christ Jesus, our Messiah, Redeemer and Lord is the expressed image of God. To know Christ is to know God. 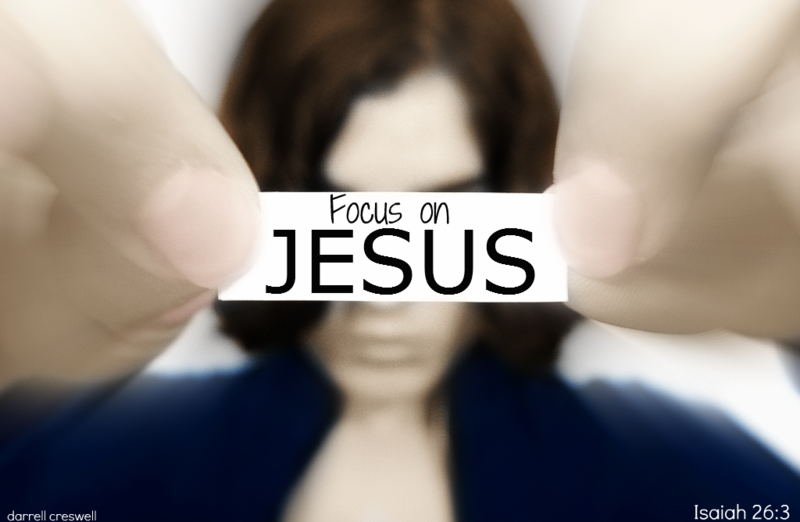 We must focus our eyes, attention, desires, wants, needs, etc. on Jesus. He is the only one that can bring us into fellowship with Heaven and restore us to the rightful place that we will forever possess, and be with God for eternity, as the redeemed, bought by the blood, children and heirs of the most high God. There is a lot going on in our world at this time. There are wars, and bombings; the killing of innocent men, women and children around the world. There is financial ruin and devastation on a daily basis. It is easy to take our eyes off of God as we watch all the turmoil taking place round us. These things may shape our world but they do not have to shape our lives. What shapes our world as believers is that God is alive and working in our heart as we focus our eyes on Him. This is what shapes our present and our future. Lovely uplifting message thank you Darrell. Blessings to you and Gracie. Thanks! I just published a book called “Enter the Rest – Lessons from the epistle to the Hebrews” that address what The book is about, it goals, target and main message which is resting in God, in depth. Somebody called it: An Israeli’s perspective on the Jewishness of the epistle to the Hebrews. You may be interested reading it. This was terribly relevant and much needed right now. Thank you so, so much. i am only 17… i also believe in jesus….pls for. This is always a good thing to do, but it seems most appropriate in today’s context. Thanks for your blog and this post. Thank you for the inspirational message. God’s word is always timely and uplifting. Many blessings to you and yours. Am so blessed by this message so inspirational. Knowing about focus and why and how to focus really powerful.